Rain rinses the local area surfaces, cleaning them and concentrating all the soils, chemicals, and other loosened substances in stormwater runoff. The chemical composition of stormwater runoff can be complex, depending upon the activities conducted in the collection area. Stormwater runoff ultimately ends up in surface waters, rivers, lakes, streams, swamps, bays and oceans. Stormwater runoff has been identified as a major contributor to surface water pollution. The current regulatory climate makes increasing demands on a number of local, municipal and private entities to monitor and analyze stormwater runoff to gather data that supports pollution control efforts and environmental studies. Configuring an active stormwater collection and measurement system can be challenging. 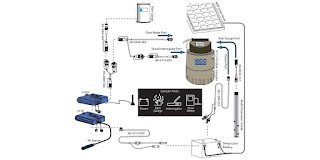 Teledyne ISCO, experts in environmental monitoring, crafted an application note that summarizes the hardware requirements for a typical system to be placed in the field. The app not is included below, but best results for a particular application or system will be achieved by sharing your environmental monitoring challenges with instrumentation specialists. Leverage your own knowledge and experience with their product application expertise and develop an effective solution. Active Stormwater Runoff Monitoring Instruments and Equipment from Instrument Specialties, Inc.